Last week, while taking my walk, I decided to zoom around inside the Castello Sforzesco to see what was up. I often go through it, imagining what court life must have been like confined, as it was, so rigidly to a small finite space defined by high walls, enclosed gardens, and that almost featureless broad expanse in the middle, while pestilence, war and poverty raged on all sides. At least that’s how I imagine it. Was boredom rampant? Depression? Was finery enough to keep everyone in their right mind? I seriously doubt it. Intrigues and conspiracies had to have sprung from a high degree of boredom. But nobility is thankfully a thing of the past. There are no brocade skirts sweeping along the Castle’s paths. No armored knights clanking here and there. 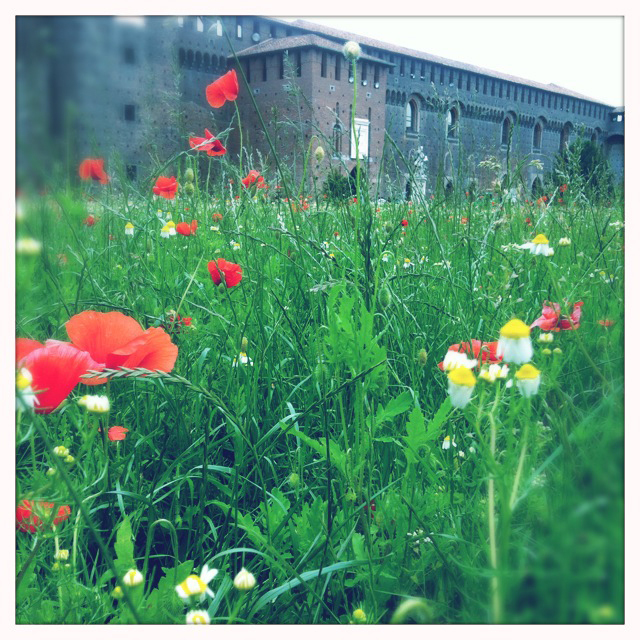 Just flocks of tourists, the occasional artisanal event (weather permitting), fields of poppies and an ever-growing population of stray cats. I’m allergic to cats and have always given them wide berth. But I love to look at them, and I feel an affinity with their solitary, self-indulgent ways. I respect their independent minds, their shifting moods, their unpredictable twists and turns. I love their ability to ignore me completely, and to keep their balance when the odds are against it. The Castle Cats rule the grounds, yet they keep to themselves in the areas that seem to suit them best. They hunt and sunbathe inside the now empty moat. They hide under the bushes, taking shade. They walk along decrepit beams and appropriately named catwalks left over from the Middle Ages, remnants of the systems that operated the drawbridges and accessed the higher reaches of the towers. 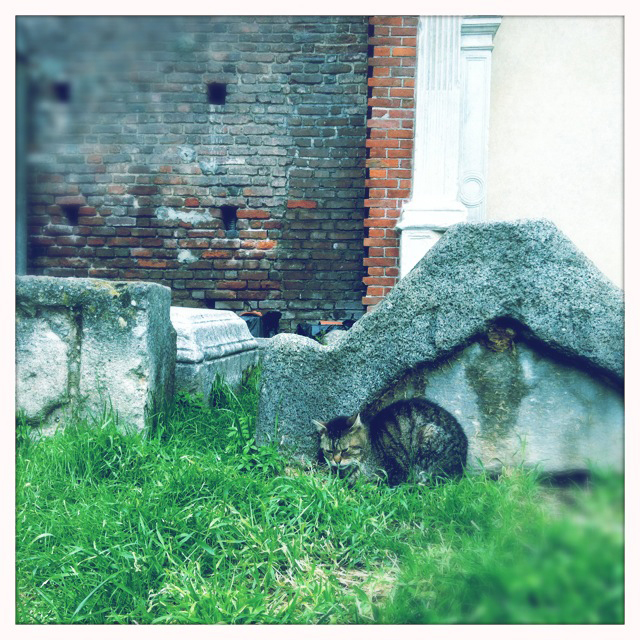 They sleep in and amongst the old stone caskets that are strewn in one corner of the castle. Someone, a “woman of a certain age”—I’ve seen her once—comes to feed them. And I believe it is she who has constructed little houses for them out of vegetable crates covered with impermeable black garbage bags to protect them from the rain. I wonder what it is about older women and cats. When does that love between them become a driving force? When does a woman decide that she’s better off with cats than with the company of other human beings? When does she start to speak their language and they hers? Like a witch with her familiars, this woman wanders among her feline friends, whispering to them in their own language. They rub against her legs, eager to be close to her. From me and my camera, they only run away. I once knew a cat who “adopted” me. Her name was Delia. At least that’s what I called her. When she first wandered into my yard, she was young and slightly underfed. I fed her. We understood each other somehow. We always stayed outdoors where the fresh air did away with my allergic reactions, and she weaved in and out of my legs, mewing and rubbing her check against my jeans. Her visits were brief and loving, but she came to visit me almost every day after our first encounter. Then I moved away. I miss her. It’s a strange and meaningful experience to be chosen by an animal. Beautiful. I couldn’t resist it. Even though I’d never been a cat lover, Delia made me love her. I wonder, in the case of the Castle Cats, if the Woman who cares for them chose them, or if they chose her. You might say it’s all about the food, but I don’t think so. There’s something else going on there. I don’t suppose it matters much. They have each other. And that’s the way they all like it. Many of you have animals in your homes and farms. I’ll be very interested to hear what you have to say about it all. Have a lovely day wherever you are. 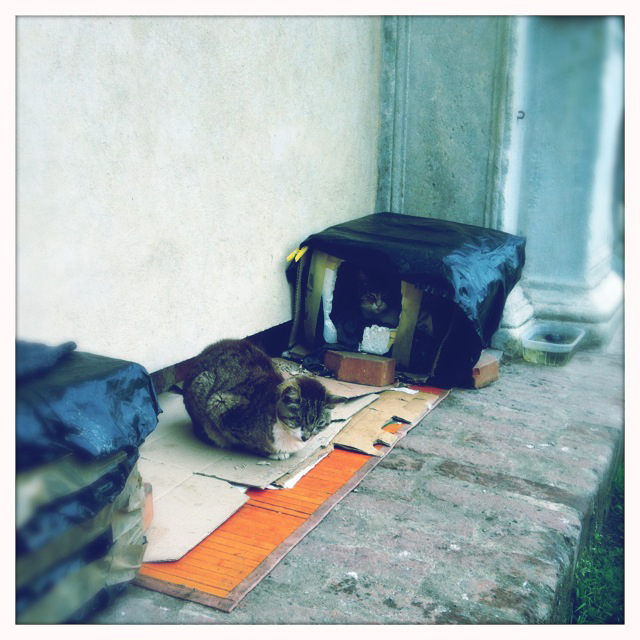 This entry was posted in AROUND US, ITALY and tagged Castello Sforzesco, cats, Milan. Bookmark the permalink. I understand completely this woman and your sentiment. I believe they choose you, food on not. It is beyond words, but a commitment none the less. Yes, people have interesting relationships with animals. I had cats for years until I moved to Europe and then could not have them with my London Paris lifestyle. I really miss them and have been thinking about that lately. I think in general, the French remind me very much of cats whereas most Americans are like dogs. One requires proof that you are worthy, or at least not an enemy before they allow you into their reality, while the other is happy to assume you are friendly until you prove otherwise. Oh…that comparison is EXCELLENT! I think you are on the money with that one. SO so true. …except now we spy on the dogs we trust just to make sure. 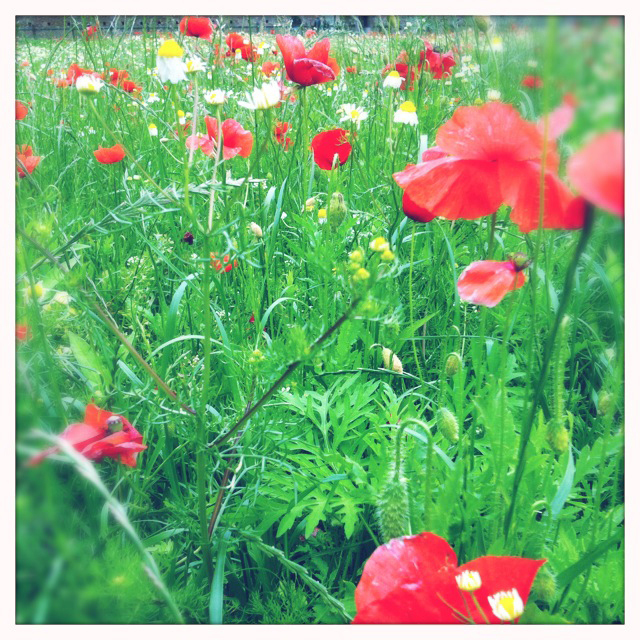 cats, schmats, it’s the poppies i’m loving. You’re so you! I love that. I remember Delia! She was such a sweetheart and a delicate, loving little being. I do believe cats adopt you; there is a sort of telepathy that transpires when a cat is interested in befriending you. You have to demonstrate a calm energy, and a stillness, and you do need to speak their language. I think there is a quality in cats that is very feminine, even in the males. It is intuition, and strength in frailty, and sensuality and that “regal” independent nature. They honor you by accepting and loving you. Dogs love you in a very dependent way, but their love is also very beautiful. They are about loyalty and undying devotion. And the wonderful thing is when these very different natures accept each other in spite of their differences and play and love life together. Wish humanity could do the same. Your observations about the difference between cats and dogs is right on. I was hoping to hear from you on this one…you’re so in tune to the critters! It’s funny, the older I get the more they mean to me. I could go on and on, but won’t, but it has something to do with getting — over time — what our role really should be. I think. I love what you wrote…and I so agree with Anna! I have always and forever lived on a farm…an orchard in my youth and of course a row crop farm now. I do believe animals talk to us and if we take the time to listen then we also can hear. It is a sort of telepathy, true. Animals know ever so much more than we give them credit for and they tell us…it is us who do not hear. Well, you know that I was always a dog person – anyone who ever came to our house on the hill knows that! But my last few years have been surrounded by cats, starting with the cat who had adopted our shop back at the old location. All told, I’m an animal person. I can have a conversation with a “critter” that is deeper than any conversation with a human. My husband (not an animal person) swears that Buddy and I had a language of our own. And the cats literally fight over me. I understand the woman at the castle. She needs them and they need her and everybody wins. Everyone knows their role pretty quickly. About how many human interactions can you say that? Years ago, one of our elderly neighbors had a dog that one of the girls wanted to walk. As a little girl, she asked permission to go ask the lady if she could walk Shadow. Over the years, Emily would go walk Shadow and then disappear (a little disconcerting for us, since a 12-year-old disappearing in a US city is unnerving!). It turned out that when she brought Shadow back, Emily would stay and talk with Miss Jean. The connection they had with that dog gave them a very special connection that was only broken when Miss Jean passed away earlier this year. The lesson? Maybe we all are better off when we bond over the animals that choose us, so that we can choose each other! Wow. And wow again. I love everything you’ve written here. I didn’t know you were so critter friendly beyond dogs. I talk to dogs on the street in the most embarrassing fashion. Babies too. There’s some filter that just falls away with age. You want to make a connection, so you do. A couple days ago, I met a corgi on the street. The owner warned me that Fatou (that’s her name; she’s a French Welsh Corgi) was shy. But, his breath was wasted. In a couple minutes the dog and I were hitting it off, having the most ridiculous conversation, and JUST AS YOU SAY, right after that I was having the greatest conversation with the man himself. Jaunty elderly guy in a straw bowler. Turns out he’s the father of a mother at my kids’ school. Small world, made smaller by the dog. I love your story about Miss Jean and Emily. It’s really, really sweet. Ciao bella. Have a good one. I have always had cats, and dogs when I was a child. I love the haughty independence of cats. Everything is on their terms. Our last cat was Tallulah, a very beautiful Abyssinian cat, who had a very definite personality. We loved her for 13 years and when she died we were devastated. We travel too much now to successfully keep a cat, so we have not replaced her…but I still miss her and would love to have another. Have you ever blogged abt the village animals? I bet you have 4-legged friends everywhere! 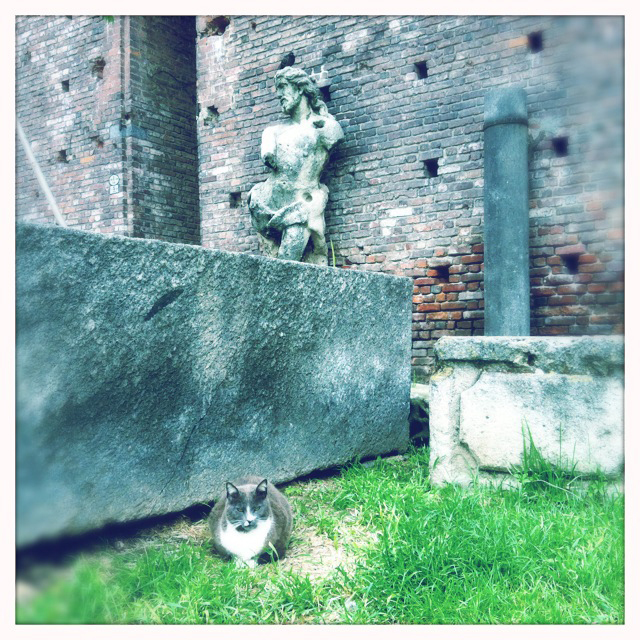 I did a post on Bagni di Lucca cats a while ago. There are always cats in every village I go to. I have to come back here more often. I miss your writing.